Aleda Madison is the Executive Director of Advocacy for Madison Adoption Associates. 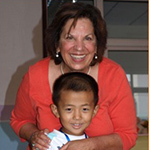 Aleda started the agency in 1981, seeking a way to bring orphaned children and loving families together. Her passion comes from her role as an adoptive, foster, and biological parent. Like many young couples, Aleda and her husband, Chuck, experienced fertility problems. Miraculously, she gave birth to her daughter, Diana, only to find herself again experiencing a multitude of problems with several subsequent pregnancies. Aleda then began shifting her efforts towards adoption. She found happiness as a foster parent, but experienced several difficulties when it came to adopting domestically. At that point she and Chuck began looking into international programs. In 1980, she adopted Michael from Colombia. The family happily added Christopher in 1983, from the same orphanage. While staying at home to care for her young children, she began networking with other adoptive parents, lawyers, and contacts to help find ways to make it easier for families like hers, seeking to adopt. In 1981, she helped facilitate her first adoption. Today, Madison Adoption Associates has assisted a multitude of families, adopting from countries all over the world. Aleda has a Bachelor Degree from West Chester University, and has completed 32 post-graduate credits. She has provided counseling to attorneys and judges about the international adoption process, and has appeared on both daytime and primetime television as an adoption expert. Aleda’s greatest love comes from travelling abroad, being able to meet and interact with the children she meets, then searching for their perfect forever families.